MTC – 505 Series Digital Torque Meter is a Metrologic instrument designed special for various torque testing and measuring, which is ideal for detecting and calibrating various powersscrew drivers and wrench with torque control, for the relative torsion torque testing and thetorsion feature parts testing. Widely used in electric, light industry, machine manufacture, scientific research and so on. 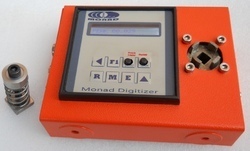 Monad torque testers capture peak torque or display torque measurement in real time mode. Catch and hold the peak value in the test. RS-232C output, connect with printer, which can print 10 value data and the Max value,Min value, Average value, eligible value and incompetent value. High and low setpoints facilitate Go/No Go testing. Download peak or continuous data for statistical process control. Calibration kits are available for popular models. Support BLDC, PMSM, PMDC, Induction, Stepper motors. Motor power switching is done automatically by the system. Motors can be tested inside their applications. Tests results are provided graphically and tabulated. Test reports in Excel format. Looking for Digital Torque meter ?